Trying to squeeze some sense out of this guy’s…jurisprudence. Este post aparece en español en ProDaVinci. 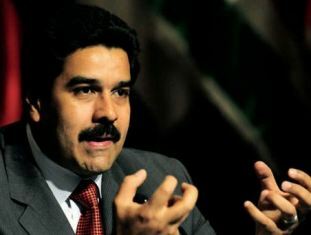 Kudos to vice-president Nicolás Maduro for his epoch-making contribution to Bolivarian Constitutional Doctrine in remarks on the Constitution’s Article 231 – you know, the one that specifies that the president-elect becomes the president by swearing an oath of office on January 10th of the year following his election. For Maduro, Art. 231 is “a formality”, like a toast on New Year’s Eve. Omitting a New Year’s toast doesn’t prevent the year from ticking over, does it? Checkmate. Now, it’s probably because I’m not a lawyer, but I have some difficulty with this. I’ve read the constitution carefully, and I just can’t seem to find the article that explains which of the other articles in the Constitution are mere formalities and which ones do actually mean the same thing as what’s written down in them. At first, I thought there must have been some mistake. An omission, maybe, or a misprint in my copy of the constitution, because if some of the articles are binding while others aren’t really but you don’t tell us which ones are which, well…the scope for confusion would seem to be very wide indeed. On further reflection, though, I suspect a higher order juridical principle is at play here. Call it the Maduro Doctrine: constitutional norms mean what they say, unless that’s inconvenient for the government, in which case they’re just a formality. Properly understood, the Maduro Doctrine is the key to understanding the constitutional order of the last 14 years: it clears up a whole range of constitutional puzzles that can’t be solved with a more literal, bourgeois reading. Take Article 314. You know, the one that establishes that “no public expenditure of any type shall be made that has not been foreseen in the Budget Law.” That one’s been stuck in my throat like a mis-swallowed fishbone for years now, since it sure does seem like the government spends literally tens of billions of dollars off budget, with no oversight and no parliamentary authorization. But now I’m starting to think again: maybe Article 314 just one of those formalities. When you think about it, authorizing public expenditure is a lot like a presidential swearing-in: you do it when you get around to it. I look forward to the Omnibus Budget Bill of 2023, which I guess will retroactively appropriate the tens of billions of dollars Fonden spent in 2005-2022. Article 115 is another one that doesn’t quite make sense until you fully grasp the Maduro Doctrine. Art. 115 seems to say that private property is a right, and that it can only be taken away from you by a court, on grounds of public utility or social interest, and then only after all appeals have been exhausted (sentencia firme) and after you’ve been compensated. It’s confusing, because the article is silent on ranting extemporaneously live on TV as an alternative means to lawful expropriation, so I’d long harboured dark suspicions that they were just randomly trampling it. But now I get it! Article 115 is just a formality. El orden de los factores no altera el producto: eventually the courts will come around and hand down those sentencias firmes, y’know, when they’re feeling better. The Maduro Doctrine probably helps explain the longstanding puzzle over Article 167, paragraph 4 as well. See, we all thought they were plain old rubbing our noses in it by refusing to credit Situado Consitutional (constitutional transfers) monies to opposition state governors, a policy that probably helped sink the re-election chances of several of them last month. We thought it was a cynical ploy to stack the deck in favor of their own candidates, constitutional norms be damned. Not at all! Now we can see that Article 167 paragraph 4 is just a formality…what the constitution says is that the central government may manipulate territorial transfers for political advantage as it sees fit. OK, granted, that’s not what it actually says, but those versed in Madurean hermeneutics can tell that’s what it means to say. Then I flip through to Article 279, the one that specifies how oversight officials such as the Comptroller General – the key anti-corruption officer in the constitution – are meant to be elected by a two-thirds majority of the Nationall Assembly on the advice of an apolitical committee of civil society representatives. Last I checked, the Comptroller General died in June 2011, and no steps have been taken to name a replacement in accordance to the constitution, with his second-in-command taking over as a permanent-interim replacement. (Charmingly, her official bio on the Consejo Moral Republicano website “forgets” to mention that she’s merely “encargada”). For the longest time I thought maybe you all were just plain thumbing your nose at Article 279, but now I get it: Article 279 is a formality – in fact, under the Maduro Doctrine, the national government gets to pick whomever it wants to be its anti-corruption investigator by decree. See, that makes much more sense now. To tell you the truth, I’m having trouble finding any articles that aren’t covered by the Maduro Doctrine. Article 255 on Life Tenure for Judges? Formality! Article 328’s principle that the military serves the nation as a whole and not any political partiality? Formality! Article 318 on the independence of the Central Bank? Formality! Article 144 on the apolitical nature of the civil service? Formality! Article 49’s Due Process guarantees? Formality! Article 254 on the independence of the Judicial Branch? Formality! Article 28 on Freedom of Information? Formality! Article 182 on Parish Councils? Formality! Article 18 on Caracas being the capital and acts of government being limited to Venezuelan territory? Formality! Article 321 on saving oil windfalls in a fund to stabilize the economy? Formality! But maybe I’m being unfair. Maybe I’m too far into the weeds. Maybe the properly binding articles are up near the beginning of the document. Let’s see, Article 6, “the government of the Bolivarian Republic of Venezuela…is and always shall be democratic, participative, elective, decentralized, alternating, responsible, pluralist and with revocable mandates”. Decentralized? Alternating? Responsible?! Pluralist?! Formality! Formality! Formality! Formality! Oh…oh dear…we’re in more trouble than I thought. Previous articlePretty please, could our next radical left wing president be a little bit more like Pepe Mujica?